We have a swamp in our front yard. Yes, there is a leak in the main water pipe leading to our house. We noticed a little puddle about two weeks ago and thought it was just from the rain, but it spread and spread and pretty soon our grass was green and growing like crazy, I had to weed every few days, and our neighbors grass kept getting yellower and yellower. It didn't even occur to me that it could be a pipe leak. I guess with homeownership you should just assume the worst right? Well, I was finally mentioning it to our neighbor and she brought it up and said she had to have hers replaced two years ago. So.... we have called a very popular plumber (I'm assuming he's popular since we have only seen about five minutes of him so far) and are just waiting for the day where we get our nice green grass dug up and our dead bushes taken out (at least we have an excuse to get new bushes though!). For now, we are living off our neighbors water supply (our hose in the back connects to their hose outlet. Thank goodness we have nice neighbors!) and we are crossing our fingers that it gets done quickly and easily. The good thing is that the previous owners did a double sealant to protect the house from things like floods, or pipe leaks. Our plumber was actually wondering why we didn't have basement flooding. Whew! Thank you home owners!!! We will forever be grateful! End of school activities: kindergarten luau, volunteer appreciation assembly, kindergarten picnic, last day of school parties. Savage Fest- This is a little festival by the Savage Mill that we go to every year. We did this quickly (it was a really hot day! ), but the girls had fun on the pony and horse rides and the moon bounces. Play Dates- a necessity in the summer I've decided. New camera for me!- I have been wanting this for a very long time. Sorry Bri, I know you wanted that HGTV. Anyway, I finally got a digital SLR and I am so excited!! Swimming lessons- yes, the swimming is coming along, slowly but surely. 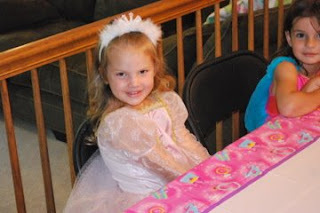 Ashtyn's four year princess birthday party- I had to do the princess theme I don't know if I would have been able to get away with anything else. It seems that's all she can think about lately. To give you some idea, the other day she threw a penny into a fountain and made a wish. I asked her what she wished for and she said to be a princess. Then, Dora (the Explorer) asked her the other day what she was going to be when she grew up and of course, a fairy princess. She doesn't even want me to do her hair anymore for fear that it won't look like Sleeping Beauty..... I am starting to get a little panicked. We will ever get away from the princesses??? 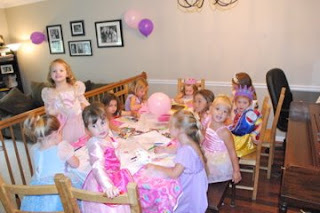 The princess party turned out fun, a little crazy at times, but fun. 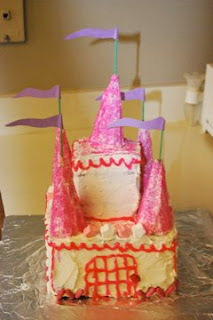 I made a castle cake, we read Princess and the Pea, we played princess pop the pea (where they sit and try to pop green balloons), we played princess find the pea (sit on pillows trying to figure out which pillow has a green golf ball under it) London Bridges (the hit of the party), princess coloring, making crowns and wands, played pin the crown on the princess, and of course cake and ice cream. The little princesses especially liked walking on our pink rug (tablecloth) up to the door. So, I would have to say it was our most successful in house birthday party ever (usually we run out of activities). So all in all, our summer is coming along. The girls are a little bored at times and I'm a little crazy at times, but I think we will make it. Now for the count down to see our cousins! Anyway, today we went in to check out the verdict for her eyes. We went to a great pediatric opthamologist in Clarksville (I hear the best in Maryland) and low and behold, she has great vision! I was so happy. She even saw things better than I did with my glasses on. The doctor said she did have a slight astigmatism, but nothing to worry about yet, and a little far sightedness (I guess it's common in children), but a 20/25 record. Horray! So no glasses for my little one quite yet.